PGI Community Edition Fortran, C and C++ compilers with OpenACC and CUDA Fortran for heterogeneous CPU+GPU high-performance computing. PGI Community Edition Fortran, C and C++ compilers and tools for multicore CPUs and NVIDIA GPUs, including all OpenACC, OpenMP and CUDA Fortran features. Enables development of performance-portable HPC applications with uniform source code across the most widely used parallel processors and systems. For more information see pgicompilers.com/community or https://www.pgroup.com/community. Parallelizing Fortran, C and C++ compilers for x86-64 CPU + GPU high-performance computing. 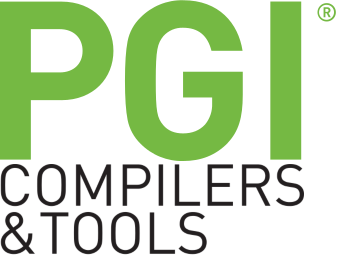 PGI compilers deliver the performance you need on CPUs, with OpenACC and CUDA Fortran for HPC applications development on GPU-accelerated systems. Includes support for NVIDIA Tesla V100 GPUs. OpenACC and CUDA programs can run several times faster on a single Tesla V100 GPU compared to all the cores of a dual-socket server, and interoperate with MPI and OpenMP to deliver the full power of today's multi-GPU servers.